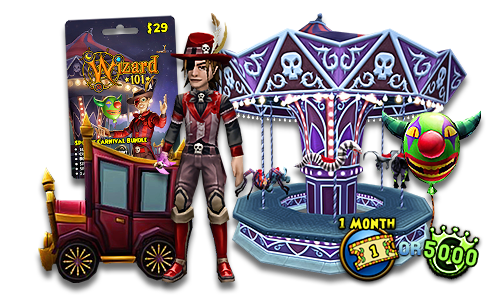 Introducing the newest Wizard101 game card available in stores now: the Spooky Carnival Bundle! You'll find this all new game card at GameStop stores across the United States, for $29. US residents can purchase a code directly on the GameStop website. 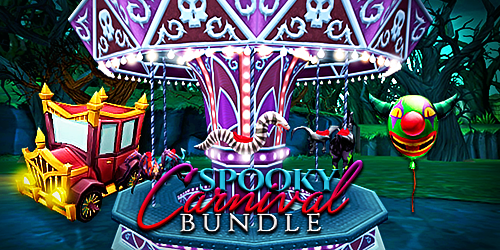 The bone chilling Scarousel Housing Item is a fully rideable scary-go-round of spectral delights, with four different views, that is sure to give up to six of your friends a ride they'll never forget! The Creepy Clown Car Mount is the first ever 4-player mount, giving a 50% speed boost, making it the perfect mount for questing groups! The terror-ific Booloon Pet comes with a Rain of Fire card at Baby and introduces the Maycast Sunbird talent. This frightful companion has a starting pedigree of 69 and excellent stats for a first generation pet. The Spooky Carnival Outfit goes up to Level 120 and gives remarkable overall stats to your Wizard! The robe itself has better stats than the Jade Robe of Mystery at Level 120. The Spooky Throwing Knife Weapon grants your Wizard 5% universal pierce, 85 critical rating, 8% universal damage, 1 power pip, 205 pip conversion rating, a Square jewel socket and Maycast Shift Bunferatu at Level 120+.